There has been a lot of media coverage of Kuzya the Amur tiger’s trip to China. Has he really killed those farmer’s chickens? Is he a threat to the public? Did Ilona, the tigress cross the border after with him? Masha, thanks for taking the time to talk to us about Kuzya and his Chinese escapade. Q: We heard that Kuzya has crossed into China, do you know if he’s still there, has he been joined by Ilona? A: No, Ilona is still in Russia, we know her location, but everyone must realize that we can’t publicize her whereabouts, the data is strictly confidential and this is to keep her safe from poachers and other risks. Q: Is it safe for Kuzya to be in China, what are the potential risks? A: We hope that authorities in China will help protect Kuzya but we must remember that tigers are at risk everywhere in the world so we must do our best to keep them out of harms’ way. Our scientific partners are also staying in close contact with colleagues on the Chinese side. Q: Can you still track his satellite collar even if he crossed into another country? A: Yes, the satellite tracking device is working properly so it allows us to monitor Kuzya’s location on both sides of the border. Q: We heard that Kuzya has killed some hens in a Chinese farm, is that so? A: No, Kuzya was tracked 30km away from the site of the attack and there’s no evidence to suggest that he has killed any farm animals. Q: Has IFAW talked to officials in China? Are you taking any steps to protect the tigers and the people living nearby? A: Yes, IFAW has alerted the Chinese wildlife authorities. The local nature reserve officials have requested to collaborate with IFAW in conducting another snare-removal campaign this winter. The campaign last winter removed thousands of snares that could trap tigers and their prey. Through the campaign, we are raising awareness in the local communities to prevent poaching of wild animals and by protecting the prey species, tigers will be less likely to kill livestock in the communities which would result in grave conflicts situations with people. Q: Would you capture Kuzya again to move him back to Russia? At the moment there is no need to intervene in Kuzya’s life, as he is avoiding people and settlements. Such radical measures are necessary only in conflict situations. Immobilizing and transporting wildlife is a rather risky process so not something that is taken lightly. Kuzya is not the only Amur tiger who has crossed the border, it happens regularly as this area is part of Amur tigers’ historical range. 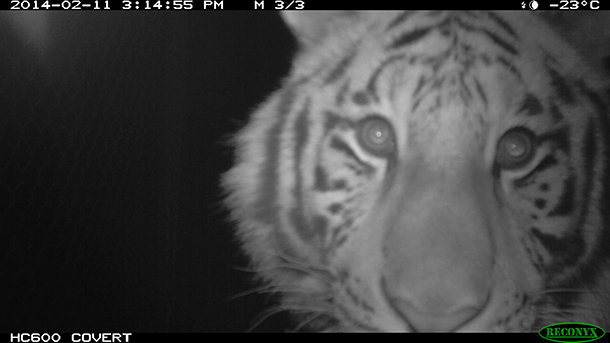 Read more about our work to save the world's last remaining tigers.